Visit the Malá Fatra (Small Fatra) and newly opened family apartments in Terchova - Mucha **** Apartments, which offers accommodation in 4 apartments with the highest standard which will excite even the most demanding client. Comfortably furnished two-bedroom apartment is located right in the center of Terchova and offer private bathroom with shower, toilet and bidet, fully equipped kitchen, terrace, 2 satellite TV and much more! After spending a pleasant night, we will welcome you with rich breakfast buffet. In July 2017 we have opened right in the apartments a wellness center which includes a whirlpool bath, Finnish sauna, infrasauna, tepidarium and relaxation room with heated loungers. Mucha apartments are located in the tourist center of Mala Fatra, Terchová, which is ideal for your recreation and active relaxation.Surrounded areas offer many activities, whether in summer or winter. Surrounding ski areas will enrich your winter holidays and in summer you can enjoy an attractive places created by nature itself. Room rate includes parking directly in front of the apartments on private property, internet Wi-Fi access, welcome traditional Slovak drink, hotels cosmetics, use of common areas, garden, barbecue during the summer months, transfer to the surroundings (1 per stay) and VAT. 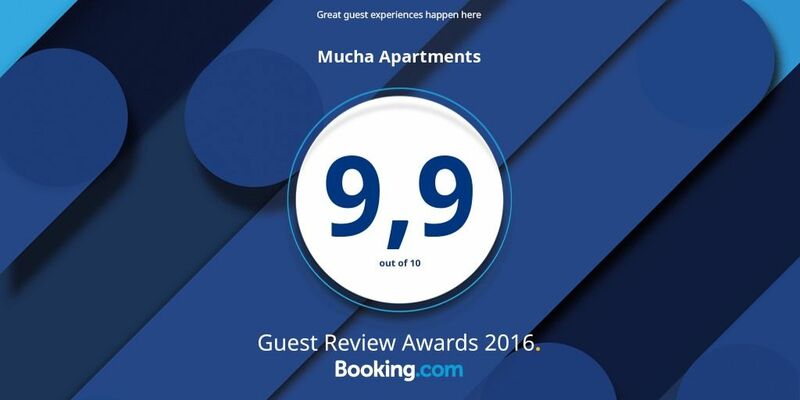 Additional discount 10%: add discount coupon "mucha" to the first step of booking and you will automatically receive an additional discount for direct bookings. You do not know where to go skiing? Come in Malá (Small) Fatra, to Slovakia! Mucha apartments in Terchova are ideal for small corporate teambuilding and family celebrations. Undisturbed environment, sheltered barbecue area, garden and all the necessary equipment for barbeque ensures that you and your guests you will be fully satisfied. Ďakujeme! Vďaka Vám, našim hosťom sa stále držíme na vrchole! Hodnotenie za rok 2017: 9,9/10! Mucha apartments are located right in Terchova and offer many benefits and discounts to its guests throughout the year. Wellness center right in the house! Discover the magic of rest and treat yourself with relax you deserve! Recover your energy in our cozy wellness center, which is opening early this summer. Take time just for yourself! Looking for a suitable place to stay for your employees? You've come to the right place! We have prepared special prices throughout the year! Read more about the offer here. Choose from our wide range of accommodation packages. You can choose from romance, family package or holiday package for the elderly!